Seat belts??? Last dispatch left us just arriving in Cartegena via a pretty nice (and wow, huge) ferry from Colon, Panama. I think we spent five days in Cartegena and it can be summed up into being kind of touristy, SO HOT-how did I grow up on Coastal Florida?-and really just a lot of walking around. If you never went, I wouldn’t suspect you would die an unhappy man (or woman, if that is your thing). 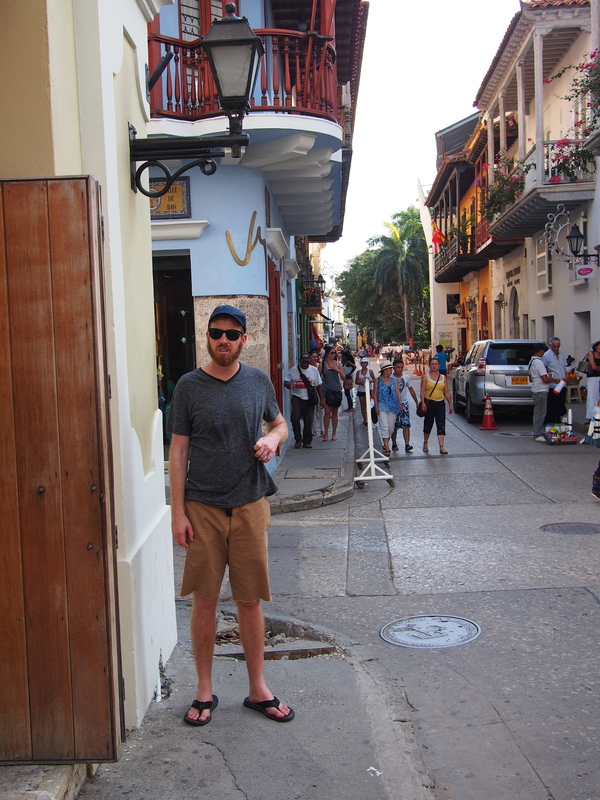 Here’s a single, awkward picture I got of Cartegena just to prove I was there, with self-proclaimed “Dad hat” and all. But hey now, we have a new policy of only one city per post! Don’t ask about Cartegena again b/c I set this post aside for Medellín only. 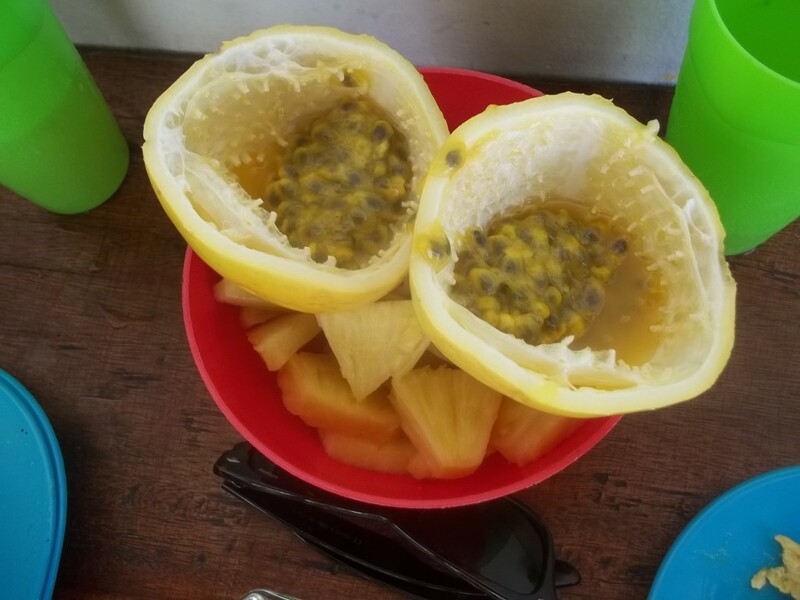 Not cool, ok?!? Per title, let’s some talk Medellín (¿por fin, verdad?). Second city in the country for me and these places just keep getting cleaner and safer-seeming. 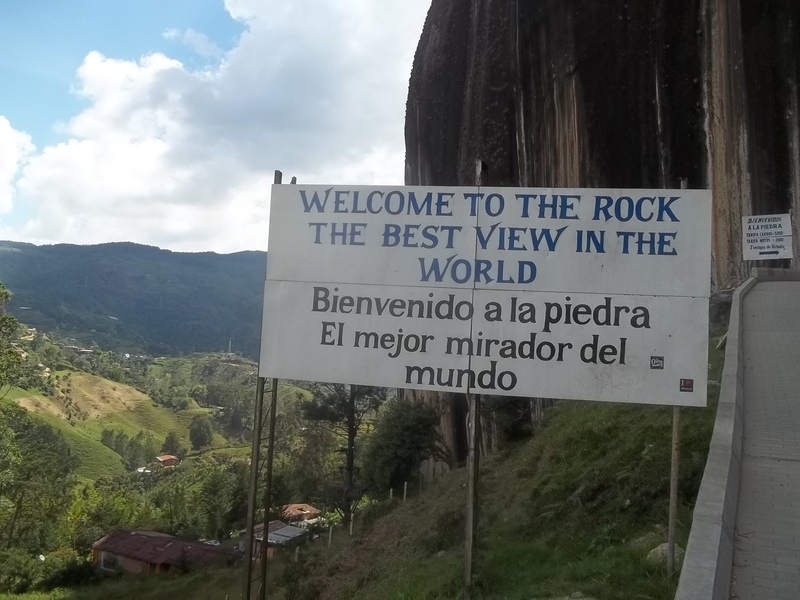 In my country (and odds are, yours too) Colombia has some pretty specific rumors. To me, the country easily pushed away the derogatory ones and happily embraced the complementary. It’s not dangerous here, there aren’t drugs everywhere, no one’s getting kidnapped, and anyone ever could make a trip alone here (including you petite, unassuming, solo ladies). Hell, Medellin has this amped-up San Diego vibe. SUPER clean, crazy-easy to get around and absolutely killer weather. Get vacation spot for someone looking to get away to something different but not too different. As far as other rumors, the more sought after ones, there are indeed beautiful women almost everywhere here. 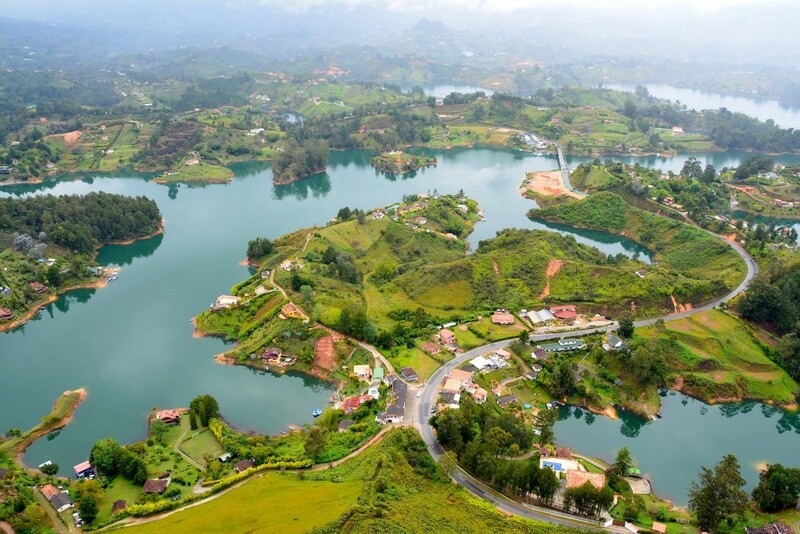 Medellín is known within Colombia to have the prettiest of the ladies and Colombian is known worldwide to have good-looking women so you can imagine this is the peak here. Though, most women are super (and I do mean super) done up, and its a little much for me. I find women who don’t need to flaunt their looks with expensive and tight clothes much more attractive than ones who do, plus there are undoubtedly 100s of posts about how beautiful women of Colombia/Medellín are, so I will leave it at that. With me for most of the Medellín time was with Canadian-superstar Ian who I had been on the road with for quite a time by then. 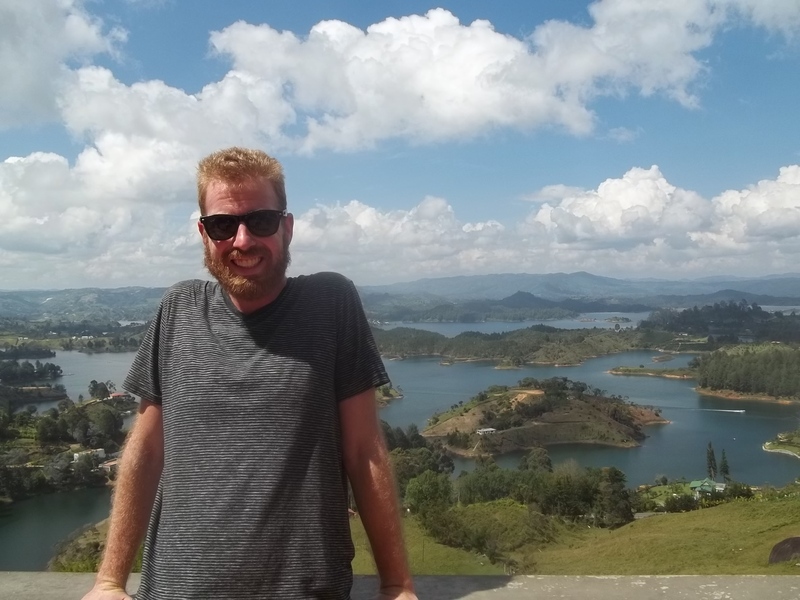 First Lake Atitlan, Guatemala, starting in October, then a 24-hour bus ride to Nicaragua, a house sit in Gamboa, Panama and finally a massive ferry across the Caribbean to Colombia. We always had others with us, but everyone had to go back for X-mas. As the two true-blue long-term travelers, we were left. But what a vibe we had at the Waypoint Hostel over by the Aqugatala stop of the Medellín Metro. Lots of room to move around, a pool, killer kitchen and a laid-back staff. It worked out especially well with Ian because he likes to spend the day reading out by the pool or just walking around, basically killing time until we can buy some food for a feast of a dinner. This happens to coincide with how I spend my days so the vibe linked quite nicely. We spent most of Medellín roaming the town, getting lost, laughing at whatever and had a great time doing so. Part of the super-easy-to-navigate Metro line is a few cable cars that run off and head up various mountains. These were maybe the coolest trips of Latin America and of course the two times we went up I had no camera.  Totally worthless, I know. 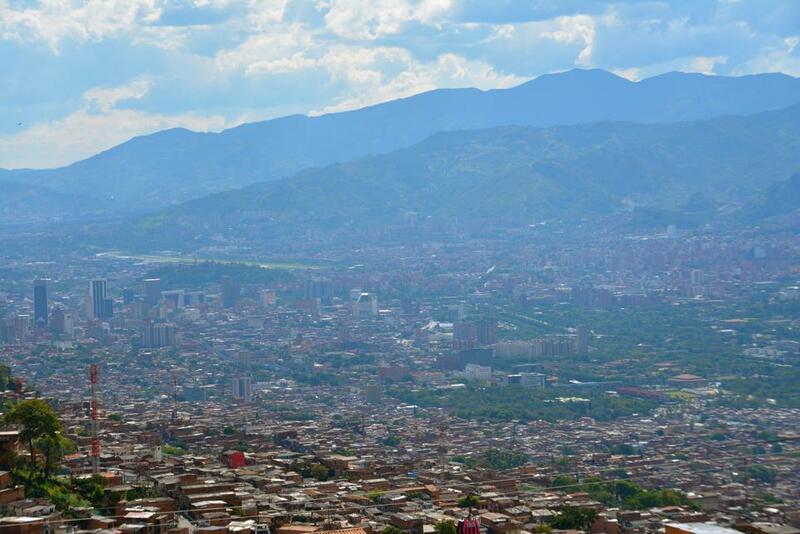 Medellín, like tons of other Colombian cities, is built into a valley surrounded by mountains. The upper-class lives on the flat ground while the lower class lives on the mountain-side, because who wants to drive up a mountain everyday if you can afford not to? 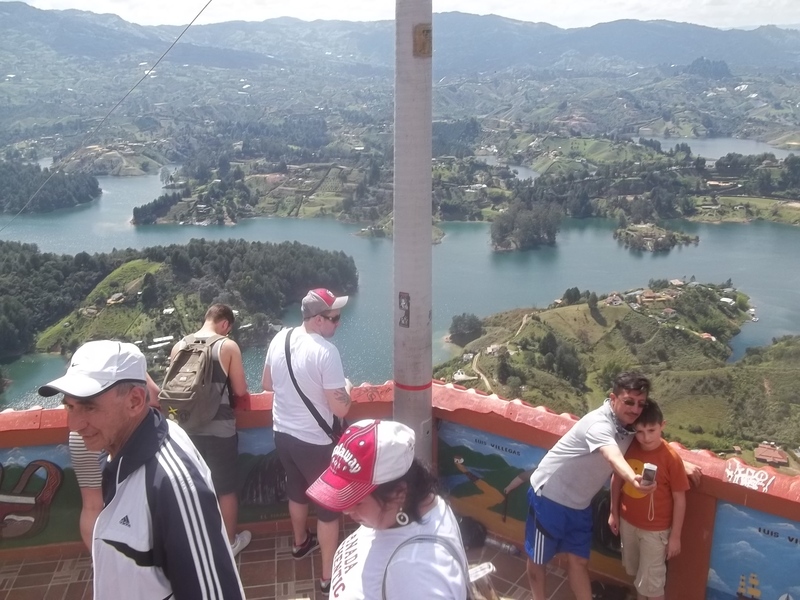 So the cable cars provided a great look into the other side of Medellín and I read did miracles for bridging the economic classes. Cool to say the least. I did meet a rad lady for about 13 whole minutes, but who connected with me on FB and sent one nice pic of the city from the cable car…Thanks Betras! A view of Medellín from the up the mountain. See the cable car at the bottom? X-mas eve/day was quite different than the usual. All us traveling orphans put together a BBQ and chilled by the pool. It’s very common here for everyone to stay up celebrating until midnight, then go to church, then all the young people go out. Also weird, a lot of European countries, Scandinavians in particular, celebrate X-mas day on the 24th. Two rad Danes in our hostel informed me of this. That night as I was going to bed around 2am, another rad French guy talked me into going to a club with him, which was super packed and lasted until the sun came up at 7. Not sure how that even happened, but a new type of X-mas eve to say the least. X-mas day! 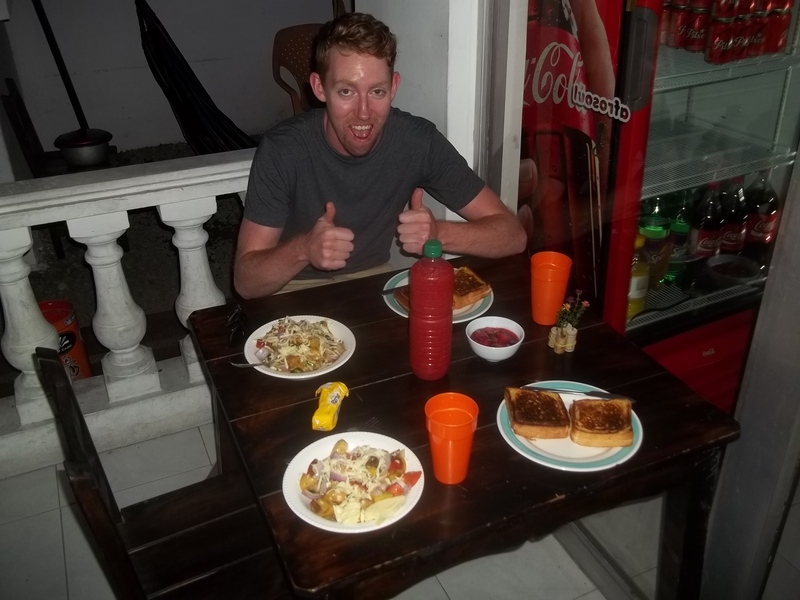 Ian and I swam by the pool all day and made QUITE a feast at night. 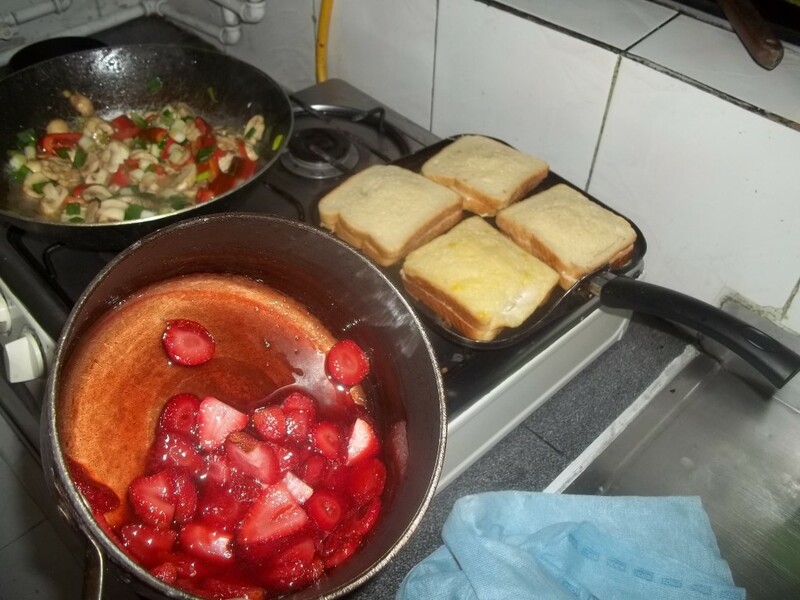 Not that this goes together at all, but we did stuff french toast and a nice veggie/home fries mix up. It was waaaaay too much food for two people but we begrudgingly pushed it all down and almost immediately regretted it lol. Best X-mas day feast, Ian you’re beast to say the least (I swear that rhyme scheme came out accidentally). After that Ian left, bound for Central-Chile for a few-month house sit. He is currently there loving it. 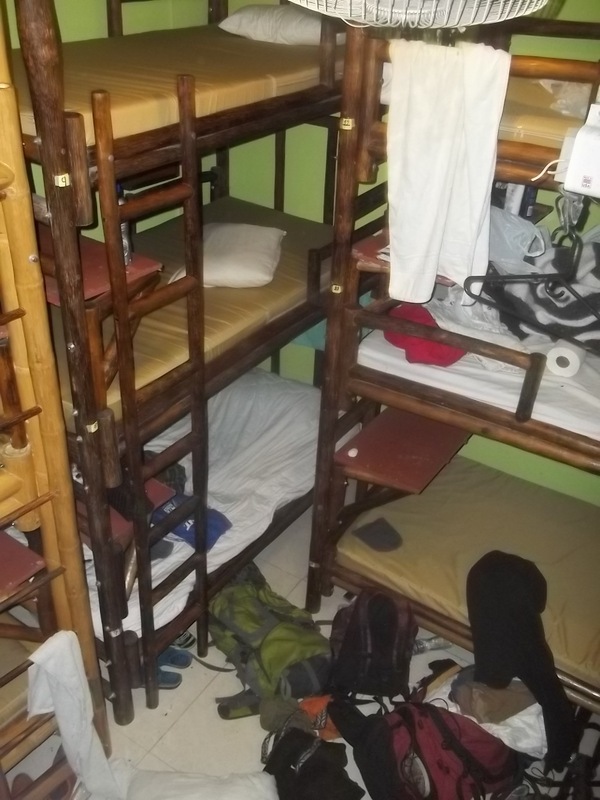 I relocated a hostel or two and wound up at Arcadia Hostel because I pretty much had to, they were the only ones with room left. I highly underestimated how busy New Years was for travelers. No one had rooms…except Arcadia, and it was obvious why. Tiiiiiny rooms with twelve beds crammed three high, laughably unorganized (almost four days to do my laundry) a kitchen the size of your thumb and “outside beer forbidden” UG. I was there for maybe five days, through New Years and all, and in the end all of us there had a good time commiserating about the mediocre accommodations. Just a bit cramped. I got the top bunk, like 16 feet up in the air. 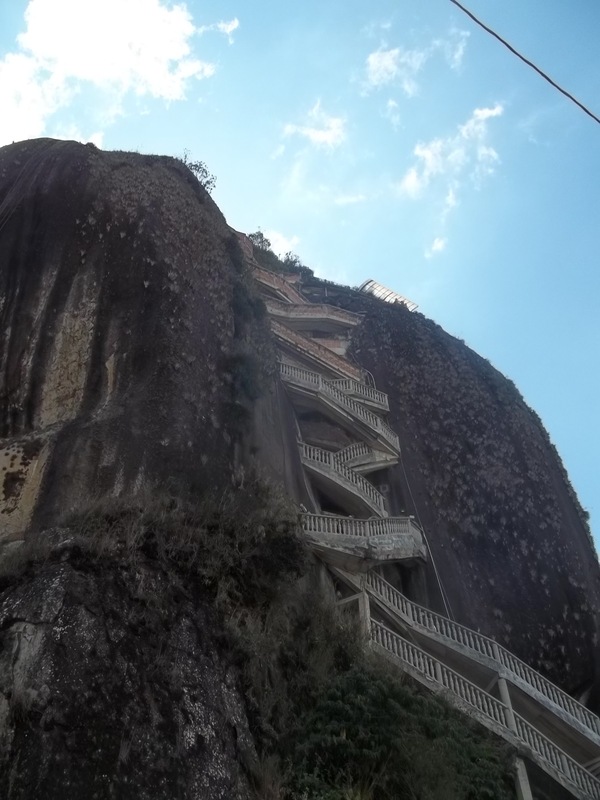 One foray worth noting was to a El Peñón de Guatapé (The Rock of Guatapé), which is simply this huge rock somehow sticking out of the ground outside of Medellín with a stairwell built into the large crack up the middle. You hike up and get a view. The pictures speak for themselves, no? Second to last day there fell in with State-ians Eli and Pat (and by that I mean I straight-up invited myself with them) and we all went to Pereira from Medellín.